Sanex is a brand that annoys me for misleading advertising. Recently they got a slap on the wrists for their shower gel adverts and were made to change the wording. 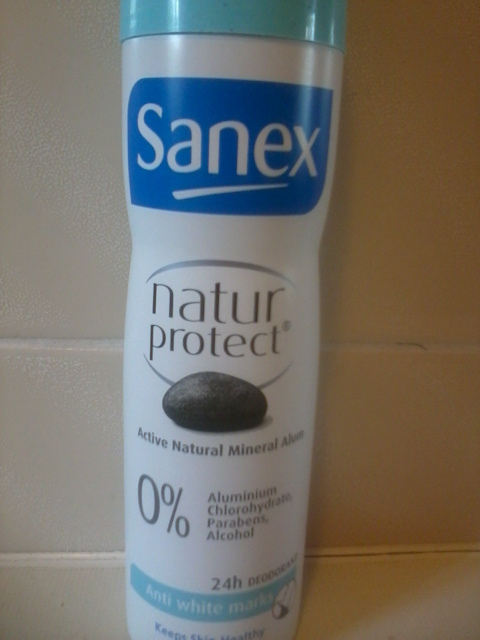 Whilst browsing the supermarket aisles I found Sanex Natur Protect 0% aluminium chlorohydrate, parabens and alcohol. I shall put it bluntly natural deodorants are not floating my boat. They are expensive and you have to find the right one to work with your body. I am stuck between a rock and a hard place. I want the junk out of my armpits but society does frown upon smelly people. This Sanex deodorant contains 10 ingredients compared to over double in Sure Aloe Vera Sensitive (a product I have used). Sanex has removed aluminium chlorohydrate which has mixed concerns in connection with breast cancer. However, the ingredients left behind are classified toxic with limited use and possibly skin irritants according to www.ewg.org/skindeep. The choice is entirely yours. For me, products free from synthetic ingredients are always going to be a better option. You cannot beat 100% natural ingredients however could this be a compromise? Yes I have heard of that, it does have pretty good reviews so I may have to invest in it. I'm so sceptical with natural deodorants though, I have bought so many that end up in the bin. I just need something that is effective without causing me pain. I use Soapwalla and it's the bomb diggity!!! I love it and I live in Hotlanta, it works so well for me. I just ordered another one today from the Etsy page. Bubble and Bee also makes a great (so I've heard) deodorant similar to Soapwalla. I really wish Tom's of Maine wouldn't be so deceiving... there's no need to have propylene glycol in the deodorant or any beauty product for that matter. Personally I think Sanex is a better choice well if you compare it to the other deodorants you can fin in the supermarkets..